Africa and France reveals how increased control over immigration has changed cultural and social production, especially in theatre, literature, film, and even museum construction. A hated of foreigners, accompanied by new forms of intolerance and racism, has crept from policy into popular expressions of ideas about the postcolony and ethnic minorities. 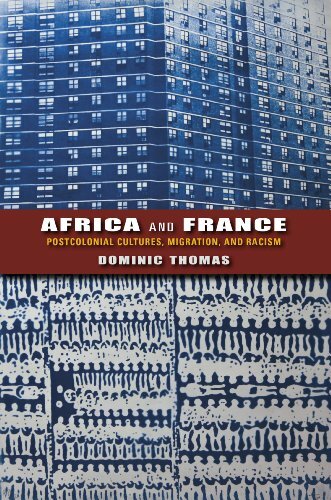 Dominic Thomas’s stimulating and insightful analyses unravel the complex cultural and political realities of longstanding mobility between Africa and Europe and question the attempt at placing strict limits on what it means to be French or European. Thomas offers a sense of what must happen to bring about a renewed sense of integration and global Frenchness. Dominic Thomas is Professor of Comparative Literature and French and Francophone Studies at the University of California, Los Angeles. He is author of Nation-Building, Propaganda, and Literature in Francophone Africa (IUP, 2002) and Black France: Colonialism, Immigration, and Transnationalism (IUP, 2007).